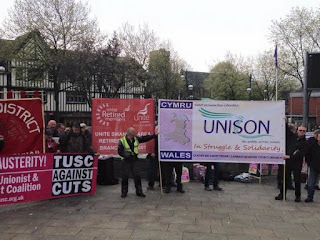 As interesting and enjoyable as promoting TUSC at various hustings events has been, speaking at Swansea Trades Council's May Day Rally was altogether different because I was speaking as a trade unionist to other trade unionists. Trades Council delegates had agreed the theme 'opposing austerity'. 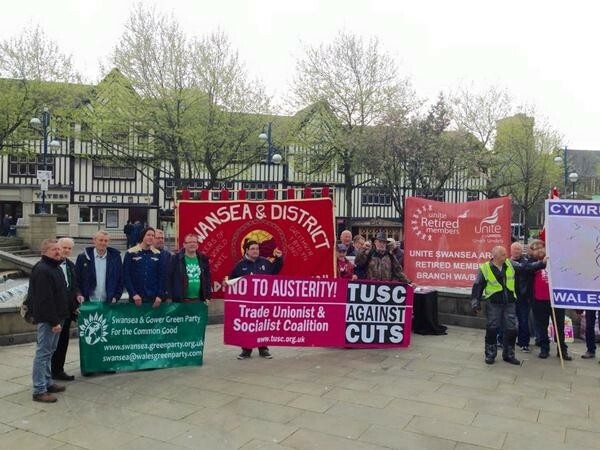 TUSC prides itself as being the 100% anti-austerity party contesting this election. Austerity is a lie to hide the transfer of wealth from the majority in society to the wealthiest at the top because while most of us have got poorer, illustrated by the increase in children living in households in poverty, the richest have got richer. The Forbes Rich List last week showed that the 1,000 wealthiest individuals in the UK have more than doubled their wealth in the last decade. So how do we end austerity? Perhaps the single most significant immediate change that could be made would be to unshackle the trade unions so that we can defend ourselves and our communities from the relentless assault on jobs, wages and services. 13 years of majority Labour Government left in place anti-union laws which are among the most restrictive in any 'democracy' in the world; in some respects Labour even added to them! Trade unionists demand that the anti-trade union laws are abolished. So does TUSC. TUSC supports unreservedly trade union policies to raise working class people out of the misery that 5 years of Con-Dem government has inflicted. Trade unions estimate that the real value of our wages has fallen by up to 20% during this government for the rich and by the rich. TUSC therefore supports the demand, overwhelmingly agreed at the last TUC, to immediately raise the minimum wage to £10/hour. This would end the effective subsidising of the bosses to pay poverty wages, which leave workers having to claim benefits to get by. It's been estimated that supermarkets, including giants like Tesco are effectively subsidised to the tune of £11billion a year because that's how much in working benefits their low-paid workers have to claim. 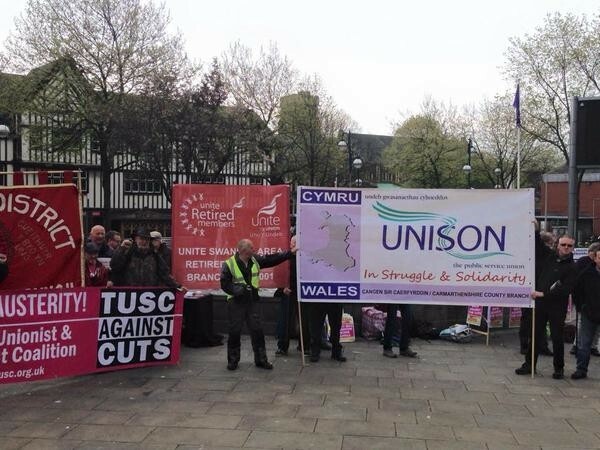 TUSC also supports trade union demands to end zero hours contracts and abolish discriminatory youth rates. It is trade union policy to demand that services like the railways, the postal service, utilities, energy companies and the banks are all brought into common ownership. TUSC enthusiastically supports these demands; if nationalised and democratically organised (including by the workers in the industry), these services could be planned to meet people's needs rather then protect the profits of shareholders, as is the case now. Everything outlined above is trade union policy aimed at ending austerity but there is only one party contesting this election that enthusiastically endorses all of it and that's TUSC. Over 75% of TUSC candidates are active trade unionists. Whatever coalition of continued austerity forms the next government we will be continuing to fight for the same policies with our trade unions, in our workplaces and communities. If you're a trade unionist fighting austerity then doesn't it make sense to vote, on May 7, for political representatives fighting for the same things?